The rebirth of realistic representation in Italy around 1300 led to the materialization of a pictorial language, which dominated Western art until 1900, and it dominates global visual culture even today. Paralleling the development of mimesis, self-reflexive pictorial tendencies emerged as well. Images-within-images, visual commentaries of representations by representations, were essential to this trend. They facilitated the development of a critical pictorial attitude towards representation. This book offers the first comprehensive study of Italian meta-painting in the age of Giotto and sheds new light on the early modern and modern history of the phenomenon. By combining visual hermeneutics and iconography, it traces reflexivity in Italian mural and panel painting at the dawn of the Renaissance, and presents novel interpretations of several key works of Giotto di Bondone and the Lorenzetti brothers. The potential influence of the contemporary religious and social context on the program design is also examined situating the visual innovations within a broader historical horizon. 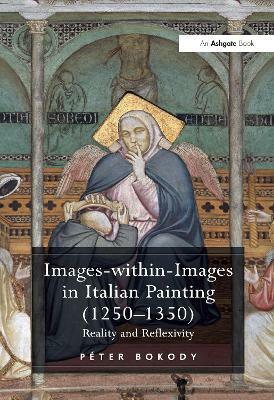 The analysis of pictorial illusionism and reality effect together with the liturgical, narrative and typological role of images-within-images makes this work a pioneering contribution to visual studies and premodern Italian culture. Buy Images-within-Images in Italian Painting (1250-1350) by Dr. Peter Bokody from Australia's Online Independent Bookstore, Boomerang Books. Peter Bokody curated the exhibition Image and Christianity in 2014 at the Benedictine Archabbey of Pannonhalma, Hungary. He is Lecturer in Art History, Plymouth University, UK.